New Modernism meets melamine and sausages in a new work by Eric Bainbridge for his first solo exhibition at Workplace Gallery. 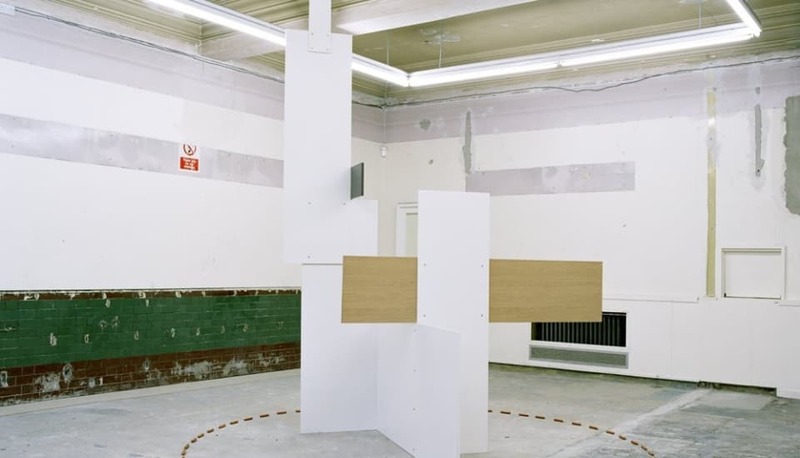 Postwurstendung conflates Bainbridge’s ongoing reappraisal of Modernist sculptural principles with arguably the ultimate reductive minimal object - The Frankfurter. Bainbridge’ s elegant and refined white melamine construction nods toward the ideologies of a Northern European modernism. Heroic and thus ripe for reconsideration, this authoritative formalism is pushed into a problematic relationship with the sausages that surround it, posing a series of meaty questions: …are they surrogates for figures that inhabit? …the throw away produce of post-war western capitalism (America and Germany embodied as Hot Dog)? …corpses from a sinister excess of radical ideals evidenced in the structure they adorn? …or simply redundant and dismembered bodies? 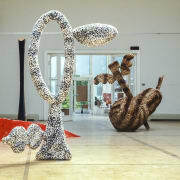 Postwurstendung is a beautiful yet darkly comic and surreal sculpture, made and exhibited for the first time In Workplace Gallery’s new space at The Old Post Office in Gateshead Town Centre.